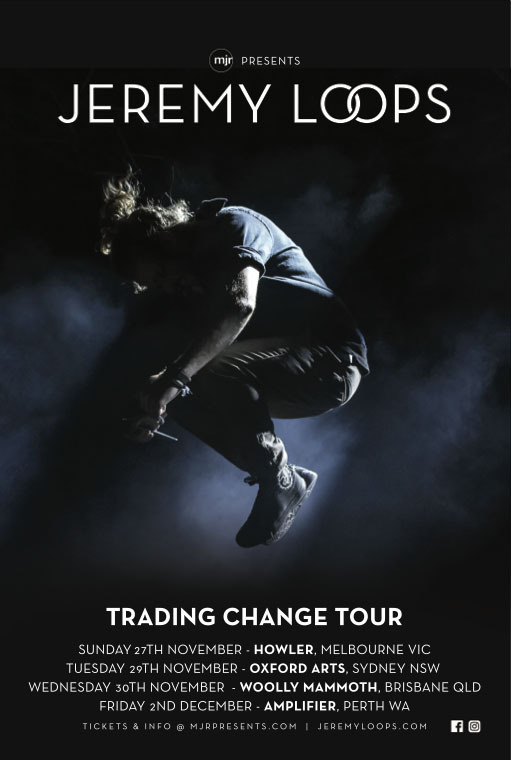 ​South African roots singer/songwriter and activist Jeremy Loops is heading to Australia for the first time this November, celebrating the release of his debut album Trading Change. The album has been a #1 smash in his homeland and is quickly catching fire across the world, charting in the UK, Germany, The Netherlands, Belgium and Switzerland. Loops’ acclaimed live performances have catapulted him to the fore with a support tour of Europe with Twenty-One Pilots becoming the door-opener for his own Continental Drift tour earlier this year, selling out venues across the continent and playing in front of over 10,000 concert-goers. Released via Create Control, Trading Change is a stunning debut featuring the singles Down South, Running Away and Sinner, combining Loops’ African heritage with roots, rock, pop, reggae, Americana and hip hop into a multi-cultural celebration embracing a globes-worth of influences. The result is reminiscent of Jake Bugg, George Ezra, John Butler and The Beautiful Girls. Fellow Capetown local and guest MC on many tracks Motheo Moleko brings a new dimension to the record, creating a link between the folk and urban scenes to create an album that truly represents 2016. Don’t miss Jeremy Loops as he plays this exclusive run of club shows in an intimate setting you’re unlikely to see again. Tickets on sale from 10am Friday 17th June.